Within 250 miles of Brighton, MA. MULTIPLE SESSIONS! Choose from “Beast-Mode Breaststroke” and “Rock the Blocks” OR BOTH! Your swimmer has so much they can learn from Olympian Clark Burckle. Sign up today and DROP TIME! Sign up for one of both sessions for your swimmer’s age group today! Please note that there are two different locations: one for Saturday and one for Sunday. Olympian Clark Burckle will be in the water for BOTH! The ideal breaststroke is when you're swimming the stroke with rhythm, grace and taking very few strokes per length. Too many swimmers ((at all levels)) have their arms and legs literally fighting each other while swimming breaststroke - thus leading to poor efficiency and much slower times than they should achieve! This session is all about the start of each race. Clark will begin by going over proper positioning on the blocks, then he will teach the participants drills to maximize the quickness of their reaction time, power as they leave the block, and streamline as they enter. Your swimmer will also learn to improve underwater dolphin kicking as well as a clean breakout. 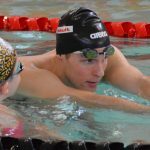 DIVE: Get off the blocks faster and with more speed and power by learning the techniques of Clark Burckle! Your swimmer will learn to set up on the blocks in a position that will allow them to explode forward. Make sure to be fuly engaged in the air as you throw your hands forward into a tight streamline. UNDERWATER DOLPHIN KICKING: The fastest swimmers in the world dolphin kick off of their walls and breakout ahead of the competition. It's not as hard as you think. Clark will help swimmers improve their technique as well as commit to a number of kicks off of every wall so that they can improve their underwaters now as well as in the future. BREAKOUTS: Learn how to cary momentum from the underwater dolphin kicks into the breakout by timing the first stroke and staying streamlined. Your swimmer will practice keeping their head down and it will make a big difference in their breakout!